What Our Veterans Have to Say About Their Old Campaigns. Editor National Tribune: There seems to be as much controversy among the Northern soldiers as to who captured Fort Gregg as among those who defended it on that eventful 2d day of April, 1865. As one of the defenders I write of what I saw on part of the Southern defence and glimpses of the Federal assault, as they rolled on in successive waves, only to be driven off and badly crippled, until men of Southern birth and nativity, who believed in “the Union of the States as one and not to be dissolved,” came upon the scene, and by desperate courage succeeded in forcing the surrender. No true soldier, either North or South, but, what cherishes with peculiar pleasure the days when he upheld the cause which he upheld, and now after the lapse of years since we put aside the harness of war and have become peaceable and plodding citizens of one common country, it becomes us to write of those days which tried men’s souls, patriotism and manhood. Fort Gregg proper was one of a series of strong inclosed works that occupied commanding positions inside of the fortifications proper of Petersburg, and was built for the very purpose for which it served, to resist an opposing army in case the main line of works were carried. A deep moat or ditch surrounded it, which crossed into the gorge by a few feet of earth left intact. The gorge was inclosed by palisades placed in a zigzag form, and barely admitted the passage of artillery. These palisades were of pine-tree trunks about 13 or 20 inches in diameter, and were loopholed for musketry. In fact, the rear of this fort was the strongest part of it, and could only have been reduced by artillery, which was not available, as several other Confederate forts had commanding range of it. The weakest part of the fort was just where the infantry breastworks connected with it, but were not completed. Its location was very near the junction of the Boydton plank road and Squirrel Level road, on the farm of one Mr. Newman, whose residence was the headquarters of our brigade it commander, Gen. Nat. H. Harris, at present Register of Public Lands at Aberdeen, Dak. The reader will bear in mind that Fort Gregg and Battery Gregg are not the same place by any means. Their positions are often con-founded as much so as Battery “Alexander,” distant 400 yards from Fort Gregg, Battery “Whitworth” and Battery “Baldwin”. Whitworth is the proper designation. Fort “Baldwin,” as some of the Federal Engineers have it laid down, was a name given to “Whitworth” in derision of a soldier of that name belonging to our command in the 19th Miss., who, for some breech of military duty, was sentenced to carry a log on his shoulders and pace the rampart of Battery Whitworth for a number of hours. It illustrates the vagaries of life, as what was intended as a reprimand and disgrace for military dereliction, was enhanced as a distinction of renown. Whitworth was intended to be connected with Gregg by an entrenched line, but the line was never completed. The uncompleted part was midway between the two. The part that connected with Gregg, unoccupied by infantry at the time of the assault, was the means by which the Federals reached the parapet and forced a surrender. Whitworth was an incomplete inclosure, and was greatly weakened by our command, which encamped for the Winter adjacent thereto, and converted the timber supports into firewood, this rendering it easily washed by the Winter rains; in fact, it did not have the strength of an ordinary rifle-pit. Old Town Creek flowed in front of Fort Gregg, and it was conceived and executed that by means of a dam across it, a large scope of country could be inundated and made more defensible. We watched the progress of the dam from its incipiency and were surprised to wake up one day and find it a thing of the past. It broke, carrying destruction in its path and exposing a very weak portion of our lines, over which the Federals soon rushed without much opposition. 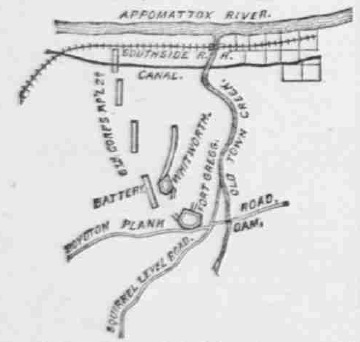 On the eve of this eventful occasion Harris’s Mississippi Brigade was located near Howlet’s house and battery the James River, and in view of Butler’s Dutch Gap canal. On the night of April 1 orders came from Gen. Mahone, our division commander, to report to Gen. J. B. Gordon, near Petersburg. As we had had a hand in every fracas in front and rear of Petersburg from Richmond to Meherren River, on the line of North Carolina, we set off grumbling and wondering “Why in _____ can’t Mahone get some other troops to do some fighting?” Nevertheless, orders had to be obeyed, and we went. I was detailed from the ranks and mounted as Courier, and as such I had opportunities of witnessing a great deal of the actions that followed. About sunrise we passed through Petersburg and arrived in front of Gregg shortly afterwards, and formed line of battle in a hollow facing west. We found everything in confusion; our lines had been ruptured everywhere, and the Union troop were in position. We found in our front long lines of Federal blue–infantry, artillery, cavalry, mounted staff, galloping Orderlies, in fact, “the pomp and circumstance of war,” closing in and around the “last ditch” of Petersburg. It was Gibbon’s Corps of four or more divisions, against whom were to be pitted a fragment of a brigade of scarcely 400 men. The fact dawned upon us that we were there to stem that torrent; to do or die; to defend to the last gasp this last stronghold left Gen. Lee. Every minute represented hours, and hours were of mighty import and pregnant with events that delayed the inevitable surrender of the Army of Northern Virginia at Appomattox. We threw out skirmishers, but they were not aggressive as usual. Delay was of as much value then to Gen. Lee as “night or Blucher” was to Wellington at Waterloo. Gen. Gibbon formed line of battle some 600 yards or more in our front, and opened with a few shells. A section of Washington Artillery, under Lieuts. Owen and McElroy, on our part responded, and then overwhelmingly overlapped by the Federal, they moved compactly forward. I was sent to the front to carry orders to burn the old Winter quarters and fight each cabin to the last. As I came in full view of the Federal skirmishers a volley greeted me that caused my “Pegasus” to practice all the tricks and nets of the much vaunted circus horse. He showed a strong inclination to go further to the front than was necessary, and in one of his plunging freaks a bullet struck him on one of his legs, breaking it. Fortunately I had him headed toward our line, and after a few frantic plunges he tumbled to the ground, myself with him. I fortunately struck out my feet “a running,” which I kept up until the lines were reached. Meanwhile, under orders, Gen. Harris had placed in Fort Gregg the 12th Miss., under Capt. A.K. Jones, and the 16th Miss., under Capt. J.H. Duncan, the two under Lieut. Col. J.H. Duncan, of the 19th Miss. The 18th and 48th Miss, were in Fort Whitworth, under the immediate command of Genl. Harris himself. A light bombardment of Gregg ensued, and then in solid columns Gibbon’s men surged against Gregg. The battlements were wreathed in smoke, and his men went down by the hundreds. The smoke wafted, and from Whitworth we could see ground strewn with many a blue-clad fellow, while the rear was full of fugitives. Again and again came rapid firing, and Gibbon’s men recoiled. A second and third attempts were likewise beat off, with tremendous loss to the Federals. Each defender had two or more rifles at hand, and while the rear rank loaded them the front rank handled them with most deadly execution. In fact the rapid firing conveyed the idea that the defenders had repeating-rifles. After a short lull in another column in blue came charging boldly to the front. This was the brigade of Genl. W.B. Curtis, known as the Second Brigade, Independent Division, Twenty-fourth Corps, consisting of the 54th Pa., 23 Ill. and the 12th W. Va. (Gen. Curtis’s own regiment), the latter regiment leading, and being, with Gen. Curtis, the first to the front. When they reached the moat they found it full of Federal soldiers, who had sought safety there from the deadly swarm of bullets. Nothing daunted by the “terrific slaughter of their comrades, these brave men swarmed up by clinging to the sides of the ditch and by pushing each other up. As the first raised themselves to the parapet they were swept away to man by rapid volleys, and rolled back dead and wounded among many others of their comrades. I distinctly remember seeing a stand of United Suites colors thrown up and into the fort by the Federal Ensign. It was done to stimulate the men, and did it; for by combined effort they swarmed up, around, and over the fort, and poured in a volley which killed and wounded about 70 of the defenders. Gen. Curtis then commanded “cease firing,” and Capt. Jones (at present our efficient Chancery Clerk) surrendered the fort to him. Col. Duncan having previously been wounded in the head. Thus Fort Gregg was lost, as was two of our regiments and Harris’s Brigade was reduced to about 200 men. As our men were marched to the rear they had to pass over the front of Fort Gregg, and witnessed the terrible realities of the attack, and they declare that the onslaughts of Fredericksburg, the Wilderness, and Spottsylvania were as naught to it. The Federal loss is estimated from Federal sources to be about 700; some estimates placing it above 1,000. Gen. Grant, in his “Memoirs,” places it at 714, I believe. Some “historians” say that the fort was so obstinately defended that only 30 of its defenders were left alive. This is inaccurate, as the loss did not exceed 70 men. While the assault on Gregg was in progress , we in Battery Whitworth were not idle. We plied our long-range rifles with some effect on the solid columns of Gibbon. A Georgia battery of Parrott guns was placed in this battery to assist in the defence, but they might just as well have been in Jericho as there, for their fire of rifled shell and shot was perfectly useless. A few Napoleons would have accounted for themselves in short meter. I glanced at a piece just at my right, and though not a practical artilleryman, I had sense enough of the arm to know about its effectiveness if properly used. I noticed particularly two shots from the piece. The range was about 600 yards, and the elevation of the piece was enough to throw the ball one mile; the shells exploded high in the air and beyond the column of attack. We vented our displeasure at such marksmanship, and freely expressed our opinions as to “what sort of stuff constituted proper artillerymen.” Why, in fact, these follows wadded their pieces while on their knees, and when an order came to move to the roar, they did so with so much haste as to overturn one of their pieces in the gorge, and we had to “put it on its legs” again. A good battery there would have been worth 1,000 men, as the column was easily enfiladed. As soon as Gregg fell, we of Whitworth saw that “our turn came next,” and girded our loins for the fray. The flag of the 48th Miss. floated above us, and many balls pierced its folds that day, and twice was it shot from its staff. The third time it was attached to a rifle, and defiantly flaunted in the faces of our assailants. Gen. Harris mounted the parapet and waved the flag over our heads, and shouted “Give’em hell, boys.” I tried to give someone hell, as I leaned against a sapling support, but caught it myself, as a bull struck it and made me “tired” of the affray. The column that attacked Fort Whitworth in conjunction with the assault on Fort Gregg was led by Brig.-Gen. T. H. Harris, whose commission was then only five days old. His command consisted of the 10th, 11th, 15th W.Va., 54th Pa., 34th Mass., 116th and 123d Ohio, and they came tumbling over the works “like they were in a hurry about something”; or as Gen. Harris, U. S. A., writes, “that we seemed shy about each other that day”; anyhow, seeing that our “blue-belly” friends had a hankering after that particular spot, and having urgent business at Petersburg to answer roll-call we left them in possession as soon us our Gen. Harris gave the word, “every man for himself.” Being peculiarly constituted by nature, I have always noticed many little things that have bearings of importance, may be, but especially if they trend to the ridiculous. Our rapid movement of change of base was fraught with much fun, and I noticed how Col. Phelps, of the 19th Miss., gathered his cumbersome limbs together for the mighty effort. As he cleared the gorge he shied to the left, and a bullet came crashing beside him. The uncertainties of life came before him, and with a 2:40-gait he lit out. Another ball spent of its mission and fury struck him in the back, and oh, my, you should have seen that 100-pounder six foot man “git.” I laughed until I was weak. Our Colonel (J. M. Jayne) stopped a ball with his leg and was captured. Gen. T.M. Harris, U.S.A., got his sword, and returned it after the war to him. Our General (N.H. Harris) was a portly man, devoid of fear, and aggressive. He did not relish the “homestretch,” and soon became tired. The run exhausted him, and while catching breath he said to me, “I’ll be d—-d if I run any more.” Just then his brother and Aid-de-Camp, Capt. Will Harris, threw up his hat in defiance of repeated summons to surrender, expecting it to fall in front of him, and he would pick it up as he passed, but it fell behind him and he stopped to pick it up just as the Federals fired a hasty volley at us. The volley stimulated Gen. Harris, his brother, and myself to renewed exertions, he much so that I believe that we led the boys into the last ditch of Petersburg, spitting into spray the placid waters of Old Town Creek. There we stood, catching our breath and preparing for further aggressiveness on the part of the Federals. Why they did not push their advantage is a mystery. If they had done so, Petersburg would have easily fallen; for, beside our depleted brigade, only Benning’s 300 men were at hand on the South Side Railroad to resist the advance.